RAPAPORT... HRD Antwerp has graded the first wearable ring made completely of lab-grown diamond, it claims. Synthetics producer Dutch Diamond Technologies (DD) created the 3.87-carat, E-color, VVS2-clarity piece from a 155-carat rough chemical vapor deposition (CVD) lab-grown-diamond plate. The company made the ring, called “Project D,” to mark its 10th anniversary. It took a year to manufacture, and has 133 facets. The piece is not the first all-diamond ring. 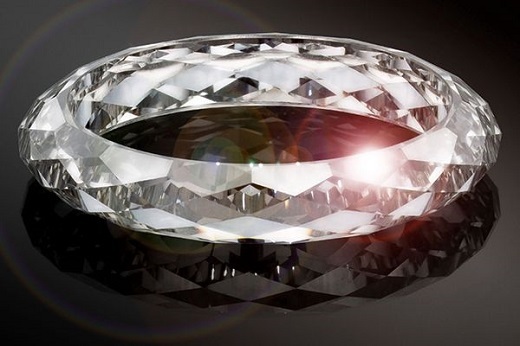 In 2011, Swiss jeweler Shawish revealed a ring made from a single crystal of natural diamond. Additionally, in December, Sotheby’s auctioned an all-diamond ring made from a single lab-grown stone. The piece, created by Apple chief design officer Sir Jony Ive and industrial designer Mark Newson for Diamond Foundry, sold for $256,250, but is still in production, Diamond Foundry said, as it’s making it to fit the buyer’s finger.